Perhaps the most famous verse in the Bible, John 3:16. God loves the whole world and every person in it. Even if they don’t love him, even if they don’t know him, no matter what their challenges are, or what they look like. God loves us all, and made us all. The autism community frequently uses the mantra “different, not less,” inspired by Temple Grandin. This quote perfectly describes how I feel about my child with autism. However, I think it describes us all. Our abilities, challenges, race, hardships, gender, and religion make us all different, but not less. 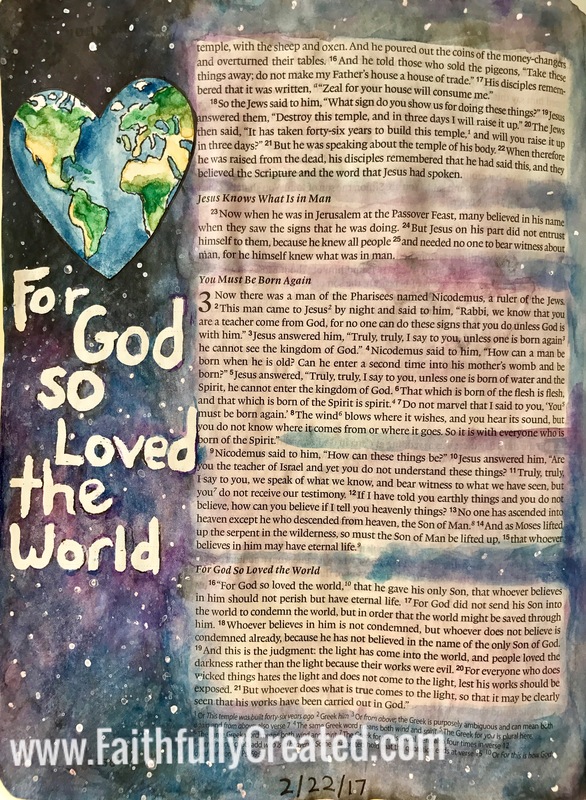 This page was created with a Molotow resist pen for the lettering, watercolors for the world and sky, the stars were splattered and a few stars (dots) added with white Uniball gel pen. The resist letters were removed with a kneadable eraser after the watercolors dried. The heart world was cut out and painted separately and glued onto the page with paper cement.